Industrial robots have been becoming the one of focus among all manufacturing equipments. However, under many existing producing environments, robots are not able to fully replace human operators. The study of high-efficiency human-robot collaborative manufacturing, thus, has been increasingly important. 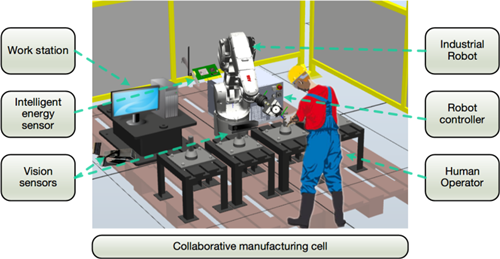 In this context, this paper presents a multi-mode perception framework for human-robot collaborative manufacturing, so as to realize the multi-source data collection, processing and analysis for the internal kinetic parameters of industrial robots, collaborative manufacturing tasks and status of producing job flow, etc. Moreover, the enabling technologies including smart energy consumption sensing, machine vision based contactless time of flight (TOF) camera and multi-source data processing which are crucial to the proposed framework are discussed, following with introductions for multi-mode data fusion and analysis, finally to provide support for human-robot collaborative job control and task scheduling in production processes.